The comments of Saudi Arabia's oil minister at the annual CERAWeek conference in Houston this week provided some sobering insights into the strategy that the Kingdom, along with other members of OPEC, has been pursuing for the last year and a half. Perhaps the ongoing oil price collapse is not just the result of market forces, but of a conscious decision to attempt to force certain non-OPEC producers out of the market. Notwithstanding Mr. Al-Naimi's assertion that, "We have not declared war on shale or on production from any given country or company," the actions taken by Saudi Arabia and OPEC in late 2014 and subsequently have had that effect. When he talks about expensive oil, the producers of which must "find a way to lower their costs, borrow cash or liquidate," it's fairly obvious what he is referring to: non-OPEC oil, especially US shale production, as well as conventional production in places like the North Sea, which now faces extinction. If these statements and the actions that go with them had been made in another industry, such as steel, semiconductors or cars, they would likely be labeled as anti-competitive and predatory. We tend to think of the OPEC cartel as a group of producers that periodically cuts back output to push up the price of oil. As I've explained previously, that reputation was largely established in a few episodes in which OPEC was able to create consensus among its diverse member countries to reduce output quotas and have them adhere to the cuts, more or less. However, cartels and monopolies have another mode of operation: flooding the market with cheap product to drive out competitors. It may be only coincidental, but shortly after OPEC concluded in November 2014 that it was abandoning its long-established strategy of cutting production to support prices, Saudi Arabia appears to have increased its output by roughly 1 million barrels per day, as shown in a recent chart in the Financial Times. This added to a glut that has rendered a large fraction of non-OPEC oil production uneconomic, as evidenced by the fourth-quarter losses reported by many publicly traded oil companies. That matters not just to the shareholders--of which I am one--and employees of these companies, but to the global economy and anyone who uses energy, anywhere. OPEC cannot produce more than around 37% of the oil the world uses every day. The proportion that non-OPEC producers can supply will start shrinking within a few years, as natural decline rates take hold and the effects of the $380 billion in cuts to future exploration and production projects that these companies have been forced to make propagate through the system. Cutting through the jargon, that means that because oil companies can't invest enough today, future oil production will be less than required, and prices cannot be sustained at today's low level indefinitely without a corresponding collapse in demand. Nor could biofuels and electric vehicles, which made up 0.7% of US new-car sales last year, ramp up quickly enough to fill the looming gap. Consider what's at stake, in terms of the financial, employment and energy security gains the US has made since 2007, when shale energy was just emerging. That year, the US trade deficit in goods and services stood at over $700 billion. Energy accounted for 40% of it (see chart below), the result of relentless growth in US oil imports since the mid-1980s. Rising US petroleum consumption and falling production added to the pressure on oil markets in the early 2000s as China's growth surged. 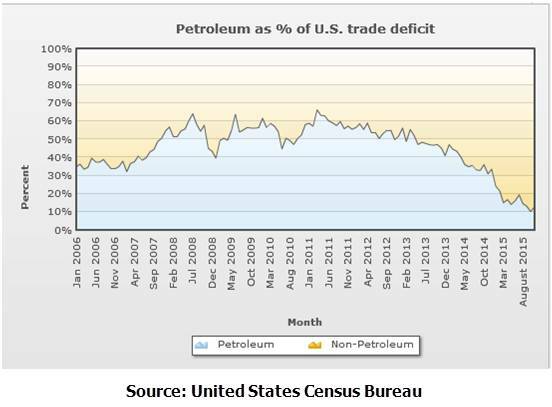 By the time oil prices spiked to nearly $150 per barrel in 2008, oil and imported petroleum products made up almost two-thirds of the US trade deficit. Today, oil's share of a somewhat smaller trade imbalance is just over 10%. Since 2008 the US bill for net oil imports--after subtracting exports of refined products and, more recently, crude oil--has been cut by $300 billion per year. That measures only the direct displacement of millions of barrels per day of imported oil by US shale, or "tight oil" and the downward pressure on global petroleum prices exerted by that displacement. It misses the trade benefit from improved US competitiveness due to cheaper energy inputs, especially natural gas. Compared with 2007, higher US natural gas production, a portion of which is linked to oil production, is saving American businesses and consumers around $100 billion per year, despite consumption increasing by about 20%--in the process replacing more than a fifth of coal-fired power generation and reducing CO2 emissions. $25 billion of those savings come from lower natural gas imports, which were also on an upward trend before shale hit its stride. The employment impact of the shale revolution has also been significant, particularly in the crucial period following the financial crisis and recession. From 2007 to the end of 2012, US oil and gas employment grew by 162,000 jobs, ignoring the "multiplier effect." The latter impact is evident at the state level, where US states with active shale development appear to have lost fewer jobs and added more than a million new jobs from 2008-14, while "non-shale" states struggled to get back to pre-recession employment. That effect was also visible at the county level in states like Pennsylvania, where counties with drilling gained more jobs than those without, and Ohio, where "shale counties" reduced unemployment at a faster pace than the average for the state, or the US as a whole. If the shale revolution had never gotten off the ground, US oil production would be almost 5 million barrels per day lower today, and these improvements in our trade deficit and unemployment would not have happened. The price of oil would assuredly not be in the low $30s, but much likelier at $100 or more, extending the situation that prevailed from 2011's "Arab Spring" until late 2014. If OPEC succeeds in bankrupting a large part of the US shale industry, we might not revert to the energy situation of the mid-2000s overnight, but some of the most positive trends of the last few years would turn sharply negative. Now, in fairness, I'm not suggesting that this situation can be explained as simply as the kind of old-fashioned price war that used to crop up periodically between gas stations on opposite corners of an intersection. The motivations of the key players are too opaque, and cause-and-effect certainly includes geopolitical considerations in the Middle East, along with the ripple effects of the shale technology revolution. It might even be possible, as some suggest, that OPEC has simply lost control of the oil market amidst increased complexity. However, to the extent that the "decimation" of the US oil and gas exploration and production sector now underway is the result of a deliberate strategy by OPEC or some of its members, that is not something that the US should treat with indifference. This is an issue that should be receiving much more attention at the highest levels of government. The reasons it hasn't may include consumers' understandable enjoyment of the lowest gasoline prices in a decade, along with the belief in some quarters that oil is "yesterday's energy." We will eventually learn whether these views were shortsighted or premature. As I understand it, the tax would be imposed on oil companies, exempting only those volumes exported from the US. The US oil industry is currently in its deepest slump since at least the 1980s. Having broken OPEC's control of prices and delivered massive savings to US consumers and businesses, it is now enduring OPEC's response: a global price war that has driven the price of oil below replacement cost levels. This is evidenced by the recent full-year losses posted by the "upstream" oil-production units of even the largest oil companies: ExxonMobil, Chevron, Shell, BP and ConocoPhillips, particularly in their US operations. The President has wanted to tax oil companies since his first day in office, but his timing here would only exacerbate these losses, putting what had been one of the healthiest parts of the US labor market under even more pressure. This tax would also increase OPEC's market leverage, providing a double hit on the cost of fuel for American consumers: We would pay more immediately, when the tax was imposed and companies passed on as much of it as they could, and then even more later when OPEC raised prices as competing US production became uneconomical. Focusing the tax on the raw material, crude oil, rather than on the products that actually go into transportation, as the current gasoline and diesel taxes do, is guaranteed to produce distortions and unintended consequences. For starters, exempting exports--a sop to global competitiveness?--would give producers a perverse incentive to send US oil overseas instead of refining it in the US. It would also shift consumption toward more expensive fuels like corn ethanol, which provides no net emissions benefits but has been shown to affect global food prices. Singling out oil, which is not the highest-emitting fossil fuel and for which we still lack scalable alternatives, will put all parts of the US economy that rely on oil as an input at a competitive disadvantage, globally, and undermine what had become a significant US edge in global markets. Petrochemicals, in particular, would be adversely affected. The President's staff is well aware that the distribution of lifecycle emissions from oil, and the structure of the industry and markets, make policies focused on consumption far more effective than those aimed at production. This is why his administration's first act in implementing the expanded interpretation of the Clean Air Act to greenhouse gases was to tighten vehicle fuel economy standards. Taxing the upstream industry does nothing for global emissions but makes US producers less competitive, ensuring a return to rising oil imports and deteriorating energy security. As widely reported, the Congress will not enact a budget containing this provision. It is hard to gauge whether this proposal represents a serious attempt to inject new thinking into the debate on funding transportation upgrades, or is simply one last shot across the bow of the administration's least favorite industry before leaving office in 349 days. It's not unusual for the wheels to come off as a presidency winds down, and this particularly flaky and futile idea might just be an indicator of that. Disclosure: My portfolio includes investments in one or more of the companies mentioned above.